Too often when you tell players to “get on the line”, their chins fall to their chests and they let out a big sigh; because typically this means they must run an up and back or a suicide. Fortunately, this is NOT the type of line I am talking about. This line refers to defensive principles. This is one of the many Shyattism’s (Larry Shyatt staples) that was brought to the University of Florida. The first day of practice the coaching staff told us to tape a white line from one baseline to the other, straight down the center of the court. This white line soon turned into a staple of practice. 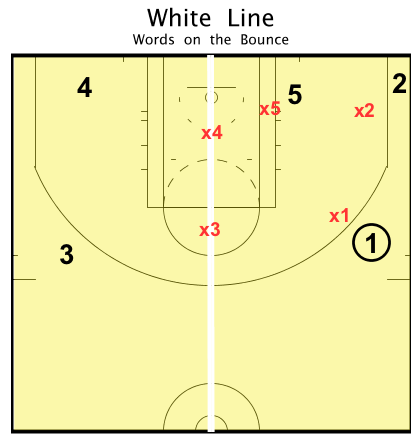 The white line separated the court into two halves: Ballside and Weakside (Helpside). As you can see in the diagram below, anytime the ball was on the wing the two defenders who are at least 2 passes (or 1 long pass) away should have at least one foot on that white line and a hand on the rope. If the offensive player is a great shooter, they might have barely a foot on the white line to shorten the closeout; if the offensive player is not a great shooter the defense should typically straddle the white line in an athletic stance ready to move. Additionally, these two players on the help side are in a tandem, or “I”. If the ball is driven baseline, the bottom defender should step up (with both feet) outside the lane while the top defender will sink and fill (and protect the rim) as the rest of the defense rotates and scrambles. 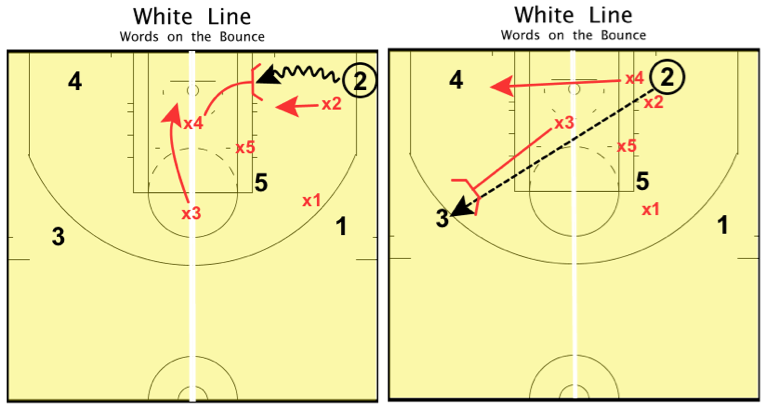 As you can see in the diagrams below, this occurs as 2 drives the ball baseline. If he decides to kick the ball across the court to 3, you are now in an all out rotation. The nearest defender to 3 would close out to the ball and everyone else would grab the nearest offensive player. Note: different coaches all have different philosophies on defensive rotations, Frame 2 is only 1 of several possibilities. I know it is not economical or practical for most coaches to tape down a white line down the center of the court everyday for practice; especially since the gym is probably shared by P.E. classes and several other sports. However, I would at least recommend putting down a “white line” (the color can be any of your choice, maybe use a school color) down the center of at least half of the court for the first month of practice. This will not only allow you to teach the white line principles, but it will also give you a reference point to use later in the season (when you no longer have the white line down) so when you instruct your players to “Get on the white line” they know exactly where they need to be. **Make sure you use tape designed SPECIFICALLY to be used on hardwood floors. One last note, I got this from Kevin Eastman (Former NBA coach – now NBA Executive); have pen and a pad of paper by your side and really focus in while you are watching these NBA Playoff games. What are they doing on defense, what are they doing on offense, how are they guarding pick & rolls, are they doubling the post, etc.?? You will be amazed at how much you pick up in just one game.